Yes, you saw that right, the stairway to spins is back. Vera&John casino is reviving the stairway to spins offer which summoned a storm back in April. So they decided to make August a money-making month too. Don’t you just love it when the promotions are simple and straight to the point? That’s what you get with Vera&John. In case you missed it back in April, the promo is all about getting free spins. Yes, the casino is giving away up to 140 free spins on some of the hottest slots to make your summer that much interesting. Getting in the draw is pretty simple, all you’ve got to do is make a deposit and opt in. So there are four spins spread over a four-week period and the trick is to make a wager that ranges between £20-£50 each week. The week of August 7th is when all the actions gets to happen and you could get your first 20 bonus spins after depositing and wagering £20. The number of free spins (and wagering amount) is continually incremented by 10 every week thereafter till 28th of August where you could earn yourself 50 bonus spins. Cool huh? The best part is, you don’t even have to make that deposit in one go. You could gradually accumulate it in small deposits, and they whole amount would eventually be counted towards the promotion. Free spins, a whole week to make a deposit and claim the spins? You’re probably thinking that it’s a deal too good. Well, here’s the catch, you have to wager the whole amount in full, and not in little nibbles. Additionally, you also get one offer a week. You can’t really deposit your first £20, wager, then deposit another 20 pounds and expect to win more free spins. That’s just not part of the deal. Oh, there’s more- a prize for players who become super fans and make deposits across all four weeks. 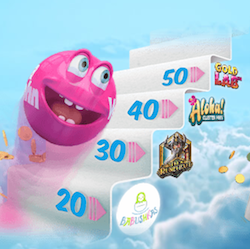 Not only will you get all the 140 free spins, but you also get to enjoy the bonus thrill spin. Where you spin till your 0.25 bet yields a single win of £2.50 or more.